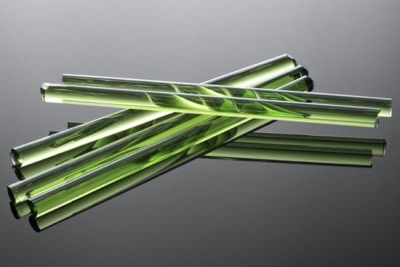 ﻿Crippy is a rich and vibrant transparent green that has little to zero air content and high clarity. This colour is extremely workable in all situations including hollow, solid and long working projects. It can be used with or without encasement in clear. It is crucial in the rainbow palette of Next-Generation Transparent s from Glass Alchemy and when blending with other cool colours. 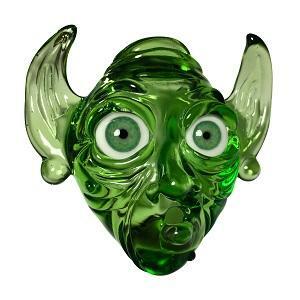 Crippy can be blown out thin for a strong green tint over clear, white or other colors. This colour is great for layering and fades as well. Don't overwork in a heavy propane flame and on a project with long working time, lower your kiln holding temperature to 980-1015 F, until it's time to anneal at 1040 F.
Crippy is beautiful when paired with Sno White, Lemon Drop or Purple Rain as well as many other colours both opaque and transparent.